Healthy Vegetarian and Vegan Stew that is simply out of this world! Kandamool! 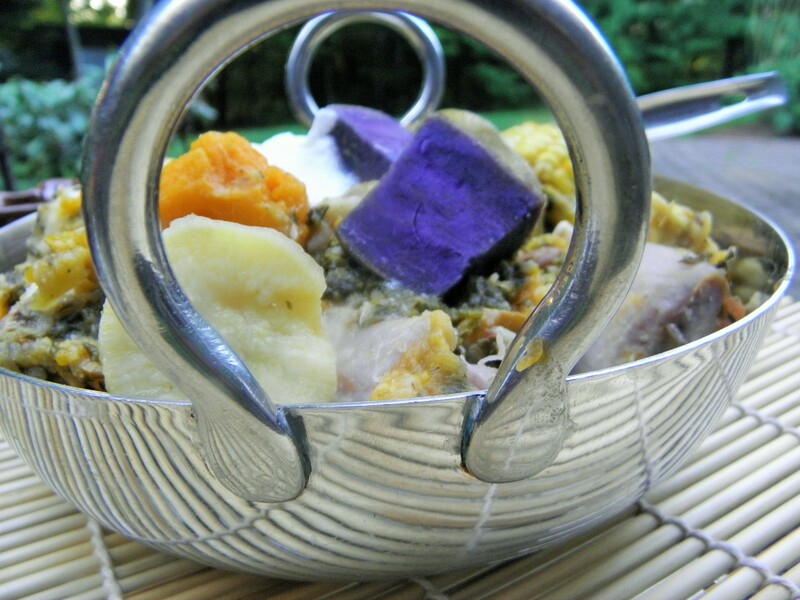 A delectable vegetarian and vegan stew. Talk about eating healthy! Traditionally the day after Ganesh Chaturthi is Rushi/Rishi Pancahmi – a day to remember the great Indian sages (Rishis) and eat like the Rishis did in the forest! So after a day of feasting, the next day is supposed to be spent eating tons and tons of greens ,root and other vegetables cooked together in this absolutely delicious and very filling stew, called kandamool ! The word Kandamool literally means root vegetables. Speaking of diets, I had started the summer with good intentions of losing the extra pounds but have instead ‘found’ some more pounds:) So this Kandamool is a good transition for me to start eating right in the fall. I ended up with a 8 quart pot full of kandamool and am enjoying the leftovers for lunches. You can use vegetables and their amounts according to your choice. All the veggies cooked together lend their flavor to the unified and delicious taste of Kandamool. It is a balance of the sweet and sour tastes. So the veggies I always include are- the red pumpkin, sweet potatoes or yams and the tomatoes. Once I have all the veggies prepped and the coconut mixture ground, I am ready to go! Root vegetables-Peel and cut -6 small arvi (colacassia/malanga ), sweet potatoes- 3 red and 2 purple ,1 medium lotus root, 1 taro. I put them in a bowl of water to clean them again. Drain. 1/2 cup raw peanuts ,soaked in water for few minutes. 3 corn on the cob shucked and cut into 6 pieces, a handful of frozen edamame, defrosted, I medium sized ridged gourd cut into 1/2 inch circles. In a huge pot,start boiling the greens and the butternut squash with some water. Add the cooked dal and some salt. This is the broth. base. Add the tubers and vegetables according to their cooking time. 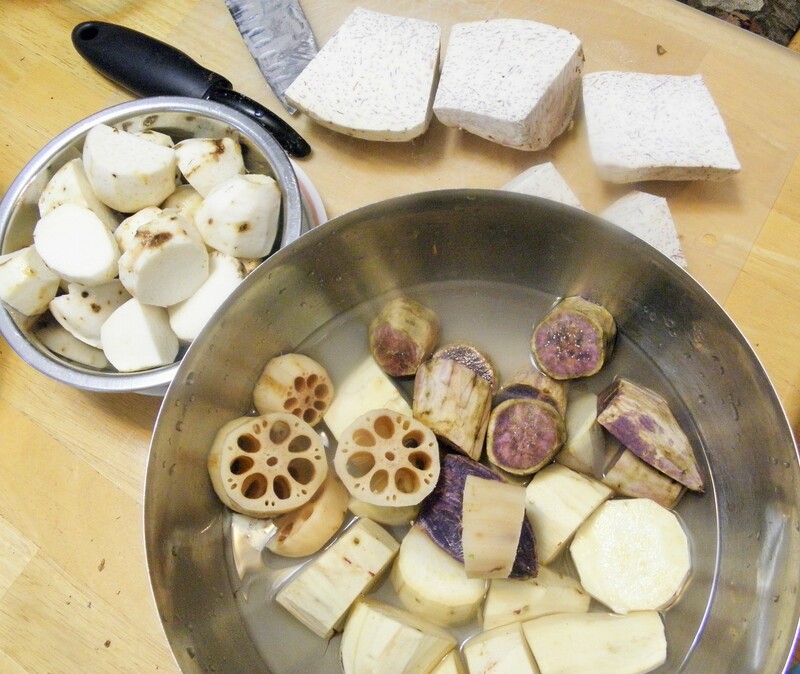 So the tubers that take longer to cook go in first- the arvi, sweet potatoes, lotus root, taro and peanuts. Add some water and let cook for 3 to 4 minutes. Add the corn on the cob and the edamame. 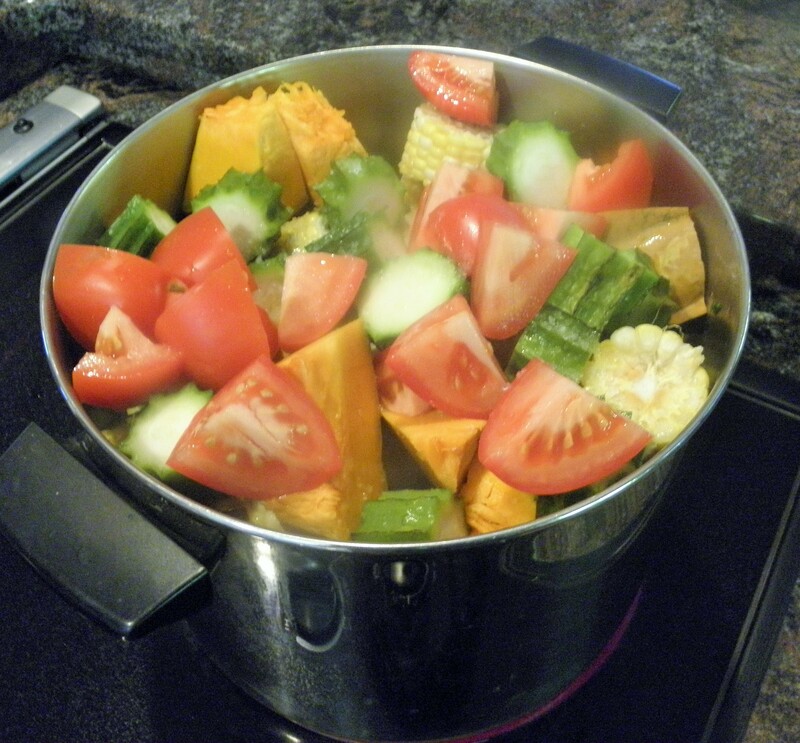 Add just enough water for the vegetables to cook.Add some sea salt as you layer the vegetables. After another 4 minutes or so, add the cut ridged gourd, pumpkin, tomatoes and some sea salt. Cover and let the mixture cook for another 5 to 7 minutes on low heat. Add the ground paste, and let the mixture come to a boil. Reduce heat to low and let the kandamool simmer for another 2 minutes to assimilate all the delicious flavors of the vegetables. Kandamool is served with a huge dollop of fresh plain yogurt. Enjoy! Notes- Timing is key in making kandamool basically to make sure that all vegetables cook evenly. Sometimes people find it easier to cook the vegetables and roots separately and then combine them in one pot with the ground coconut mixture and let it simmer together for 2 minutes or so to marry the flavors. That’s truly a yummy pot of green goodness. This combine of root veggies is made in different parts in different names but the outcome is same, lipsmacking delicious stew. It’s so hearty and fulfilling and makes the gut so happy. I loved how nicely you have explained the entire process and substituted International veggies and tubers so that people across the globe can savour this heirloom INDIAN dish. 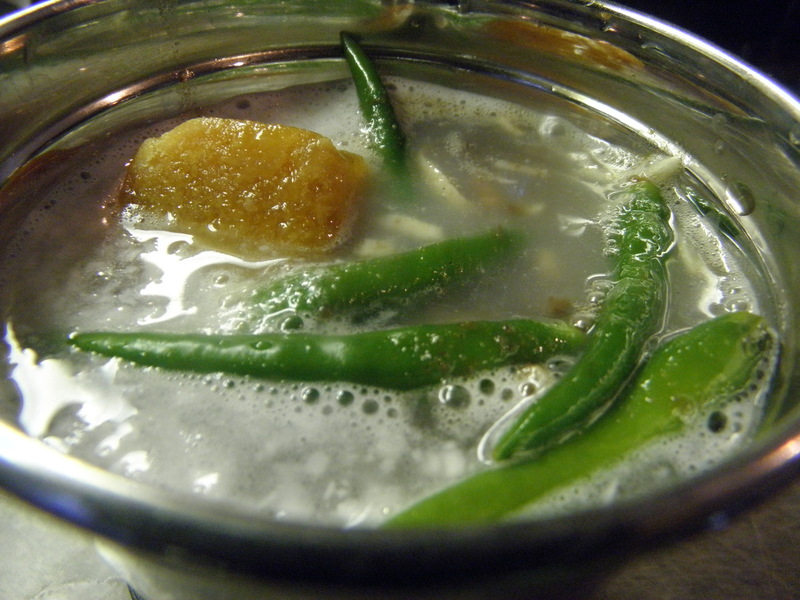 Very interesting recipe Sandhya! Perfect for autumn, when we also get so many root veggies! Thanks Naina. Yes it is perfectly timed, when we get end of summer veggies and fall root veggies. Thanks Soma. This is one of my most favorite traditional dishes! Hope you like it too. Sandhya what a colorful collection of the roots.They say “more the color, the healthier it is”. Rishi Pancahmi yay! This is a favorite of mine with all fall veggies now available, Rita. Thanks so much Loretta. I am in awe of how our ancestors came up with these festival foods- it was all around what was good for our bodies and what was locally available then. 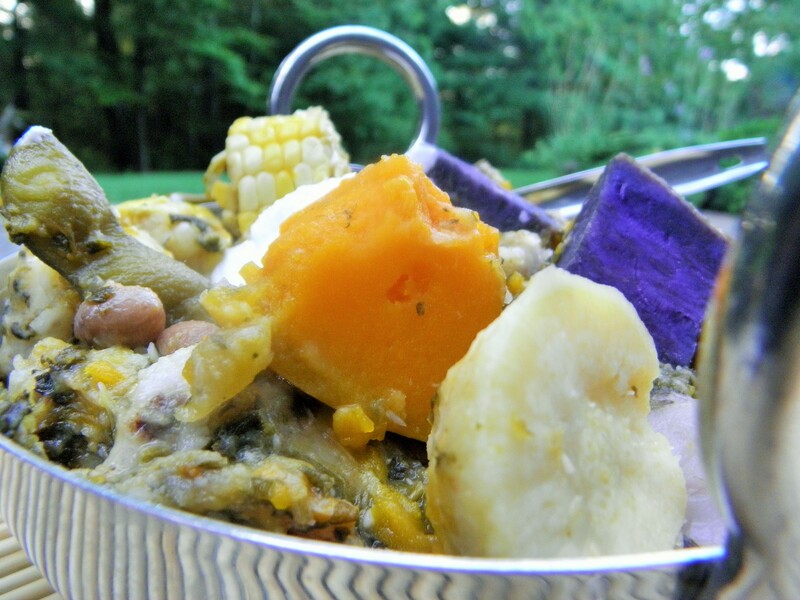 I like this healthy root vegetable stew and it goes so well with fall veggies here.